With the goal of self-sufficiency for the community and people in mind, Webequie has embarked on the development of it's wilderness tourism industry. We are situated in a remote area surrounded by the Winisk River Provincial Park. The surroundings are pristine, and likely something you have never experienced before. To allow visitors to experience some of the best fishing and hunting in northern Ontario, we have numerous wilderness camps. Numerous personalities have visited Webequie, and always have a spectacular tale to tell after leaving. Famed professional sport-fisherman and television celebrity Bob Izumi is just one of those folks. Webequie is a traditional Ojibway community with a population in excess of six hundred people, and has much to offer visitors interested in aboriginal culture. For thousands of years, we have lived here without european exposure. Self-sufficency was a matter of taking care of yourself or vanishing. Food, clothing and shelter were of the utmost importance, and the people had to obtain these things by their own hand. Entire families could, and sometimes did, die off when these items were in short supply. Travel across the land was necessary to find wild game, a source of all three items. Caribou, moose, bear, beaver, otter, marten, geese, ducks and other birds and animals were hunted and trapped for fresh meat, skins to make clothing, and teepees, a tent-like structure made of the larger hides. Animal bones were used to make tools and jewellery. Meat was dried to preserve it for when food was scarce. 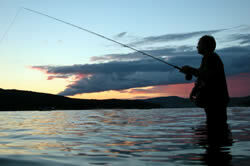 Fish has always been plentiful, and is obtainable most of the year. Local species include pickerel (walleye), northern pike (jackfish), trout (lake, brook, brown, speckled and rainbow), whitefish, sturgeon and others. Fish was also smoked to preserve it. Locally smoked whitefish is particularly tasty, and is still prepared in large quantity. People used the forest to make tools, snowshoes, crude furniture and birchbark canoes and teepees. Berries were gathered from spring through summer. Berries were also mixed with dried fish to make pemmican, a nurtritious and tasty meal that preserved very well.Children did, and still do, eat it like candy. Certain roots, herbs and leaves are medicinal, and were gathered by local medecine men and women to doctor the sick, injured and elderly. All of the above activities continue to this day. Webequie people are very friendly people, extremely proud of their heritage. We welcome visitors interested in learning about our practices of many years. When walking through the community, you will always see someone busy doing something. Stop and say hello, and you will likely learn something thet you never knew before. Feel free to ask questions. Arrangements may also be made to travel out onto the land, and take a step back in time to another era.